The graphics industry calls this machine "The Workhorse" for good reason. 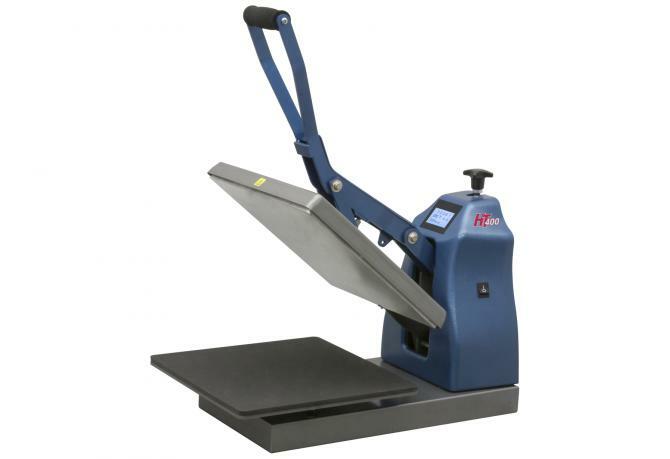 The HIX HT-400 Clamshell Press is rugged, durable, and made to perform. A must-have for any serious start-up business, the HIX HT-400 has earned respect for its numerous capabilities and reliability. With over 100,000 units sold throughout the world, this machine is regarded as an industry standard. Many customers have used this heat press for over 30 years of worry-free service. If you're looking for high production capabilities, this is the heat press you need! The secret to it's success is in the casting. Every heat casting at HIX is manufactured in a permanent steel cavity mold using a HIX-exclusive aluminium alloy for maximum heat transfer. The HT-400 has a 15" x 15" heat platen that can apply all types of transfers on items up to 25mm thick. The floating lower platen helps provide even pressure on thicker items, no matter where it's applied. HIX presses provide completely even pressure from edge to edge, even at high temps. The HT-400 features a touch-screen controller that is adjustable up to 999 seconds, shows time countdown on readout, beeps after elapsed time, and resets when the handle is raised. The calibrated digital temperature control is adjustable up to 232°C and displays the current temperature.